Russian Prime Minister Dmitry Medvedev has appointed First Deputy Transport Minister Oleg Belozerov as the head of Russian Railways (RZD). 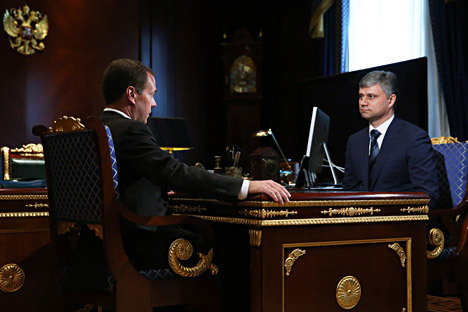 "I have made the decision to appoint you as the director of joint-stock company Russian Railways with the simultaneous lifting of the responsibilities as first deputy transport minister of the Russian Federation," he said at a meeting with Belozerov on August 20. "You must immediately begin performing your duties. Tomorrow all the transfers of authority will take place. I think that Deputy Prime Minister Arkady Dvorkovic, in his capacity as RZD board chairman, will introduce you," Medvedev said. Belozerov, 45 years old and a native of Ventspils, Latvia, worked in the Ministry of Transportation since 2009. In April 2014 he was elected to the Russian Railways board of directors. As Vice Minister of Transportation Oleg Belozerov curated the program of the country's transportation system development, which had been confirmed by Dmitri Medvedev in April 2014. The program's total volume of financing for the whole period until 2020 amounts to about 12.3 trillion rubles ($183.2 billion), out of which 8.85 trillion rubles ($102 billion) were supposed to come from the federal budget. Before coming to the ministry Belozerov directed the Federal Road Agency, a special organ responsible for the repair and management of Russia's roads. In this position he provided solutions for the transportation problems related to the preparation of the Olympic Games in Sochi. Under his leadership a new highway was built in the city helping to unclog hour-long traffic jams. The acting governor of Kaliningrad region, Nikolai Tsukanov, who is running for the governorship, nominated RZD chief Vladimir Yakunin for a seat in the Federation Council, Russia's upper house of parliament.